Golf is never far from the avid player’s mind, even in the dead of winter. 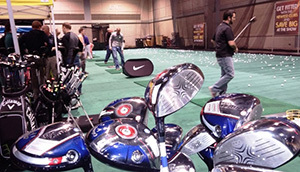 Fortunately, the start of the New Year brings plenty of golf diversions, including the upcoming Kansas City Golf Show. Local courses, meanwhile, are getting ready for the new season by setting their annual pass programs and other promotions. The newest addition to local golf is still taking shape and it’s hard to miss. Just drive down Nall Avenue on the north side of I-435 in Overland Park. That towering net surrounding a construction site is part of the new TopGolf entertainment complex due to open this summer. 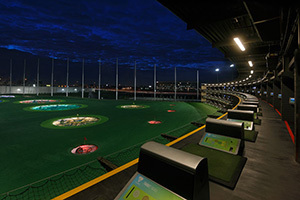 TopGolf will be a state-of-the-art indoor/outdoor golf center for practice and competition. 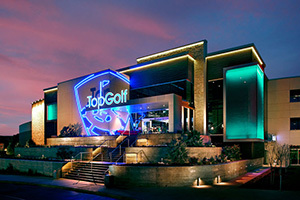 TopGolf is a national company with 12 similar centers in the United States and three in the United Kingdom. “Top” stands for target-oriented-practice. Built on three levels, TopGolf will feature 102 climate-controlled hitting bays for up to six competing players at a time. Players hit balls containing microchips that track shots as points are awarded for hitting in-ground targets. Players tee off from covered areas and hit into an outdoor field or the surrounding nets. Players of all skill levels can use the facility, year-round. Shown here are some photos from their current facility in Houston. The 65,000-square-foot complex will have restaurants, bars, 230 high-definition flat screen televisions, and 3,000 square feet of private event space. TopGolf projects that 450,000 people will visit during the first full year, nearly half of whom consider themselves non-golfers. Tim Carrigan, local golfer and editor of KC Golfer Magazine, has frequented the TopGolf facility in Chicago while on business trips. “It’s a lot of fun and you see golfers of all skill levels. TopGolf chose Kansas City for its latest location because the community is growing fast, said Randy Starr, the company’s chief development officer. In addition, Overland Park is a strong business and entertainment hub, he said in a news release. “We are excited to bring our unique concept to Kansas City as it will offer another entertainment venue for residents and corporations,” Starr said. The facility is also just a few blocks from the Overland Park Convention Center, the company noted. 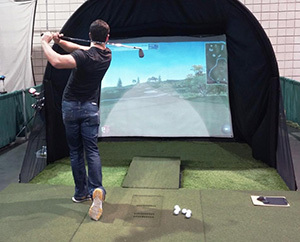 Of course, the convention center is home to the annual Kansas City Golf Show, which is set for February 6-8, a Friday through Sunday. It opens at 11 a.m. on Friday and ends at 4 p.m. on Sunday. As usual, the show will feature free top-flight golf instruction, an indoor driving range to try out all the latest clubs from major manufacturers, multiple contests and interactive exhibits, and scores of booths operated by golf courses and other businesses. Drawings and other games of chance are held at many booths for free rounds or merchandise. A popular booth last year was the TruGolf Simulator set up by Robertson Entertainment with longest drive and closest to the pin contests each day. Tickets, good for all three days, are $12, but just $10 for seniors 60 and over and free for kids 12 and under. More information is available at http://kansascitygolfshow.com – or, for a recap of last year’s show, check out our article by clicking here. 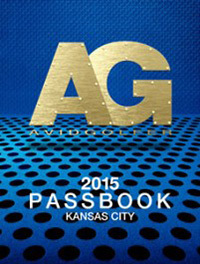 As for golf itself, a new program called the AVID GOLFER Passbook is being offered through a partnership between KC Golfer Magazine and AVID GOLFER to give players significant course discounts. The passbook can be used for one round at 12 different courses for only the promotional cost of the golf cart. Added all up, the value of the included golf exceeds $400, but it costs just $39.95 and is good for the entire year, with varying restrictions on days and times of play. To sweeten the deal a bit, the Passbook includes a gift box with a cap, ball marker, sleeve of Callaway balls, and sunglasses. The courses available with the pass include a formidable lineup of KC’s best: Falcon Lakes, Falcon Ridge, Heritage Park, Hodge Park, Painted Hills, Royal Meadows, Shirkey, Shoal Creek, Sunflower Hills, Tiffany Greens and Winterstone. A Passbook can be obtained through iDealGolfer’s website or through KC Golfer Magazine: https://www.kcgolfermagazine.com/. This is also the time of the year when many golf courses are rolling out their annual pass programs. If you have a favorite course, you can often find great deals. 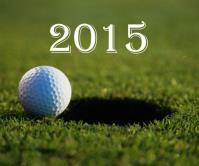 At the time of this writing, many programs are still being put together for 2015, but often they include a various numbers of rounds or unlimited golf. Its best to “do the math” and figure out where you’ll be playing, how often, and what makes the most sense. Of note, are the courses we featured on our online magazine in 2014. In Kansas, those courses are Sunflower Hills, Deer Creek and Leavenworth Country Club. In Missouri, they are Country Creek, Winterstone, River Oaks, Hodge Park, Shoal Creek, and Liberty Hills. Please visit the course websites or phone the pro shops directly for details.